TORONTO, ON, October 24th, 2016 - Peraso Technologies Inc., a leader in Wireless Gigabit (WiGig®) chipsets, announced today that their WiGig USB Adapter Reference Design Kit is part of the Wi-Fi Alliance test bed for Wi-Fi CERTIFIED WiGigTM and among the first products to achieve certification. Wi-Fi CERTIFIED WiGig is an interoperability certification program from the Wi-Fi Alliance, with products based on technology defined in the IEEE 802.11ad specification. As one of the leading wireless chipset manufacturers, Peraso has been an active participant in the standardization of 60GHz technology and development of the IEEE 802.11ad specification. 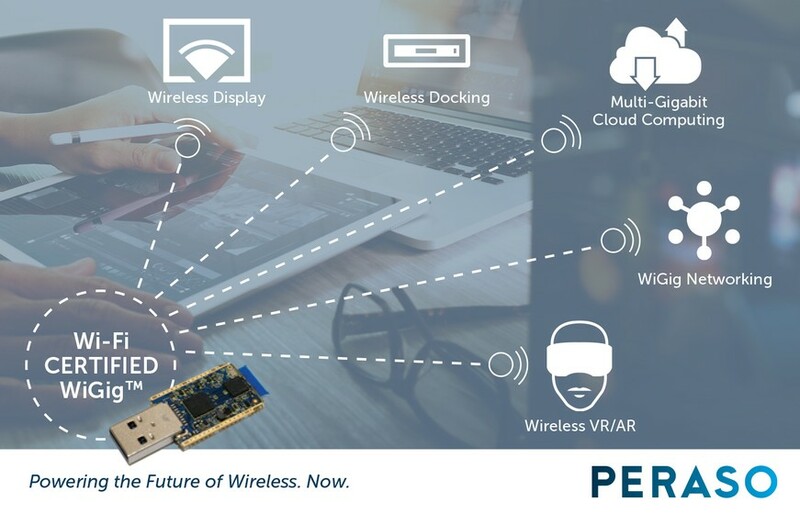 The Peraso WiGig chipset will enable the development of a host of wireless applications, including residential and enterprise networking, wireless display, multi-gigabit broadband and mesh networking, and wireless virtual reality. WiGig technology delivers multi-gigabit connectivity in the uncongested 60GHz spectrum, providing unparalleled speed and performance, where throughput, low latency and reliability are essential. Peraso's WiGig USB Adapter Reference Design is fuelling the WiGig ecosystem, providing a solution for backward compatibility of existing Wi-Fi equipment. WiGig enables a range of applications, both in-room as well as outdoor line-of-sight, where the need for extremely high bandwidth is critical to deliver an optimized user experience, including: AR/VR, media streaming, video/security monitoring, enterprise applications, metropolitan backhaul, gaming and more. Peraso is currently in production with WiGig® IC solutions, addressing both next generation Wi-Fi opportunities in the consumer electronics (CE) space, as well as outdoor devices in the 60 GHz wireless infrastructure space, and continues as a vital player in the Wi-Fi Alliance compliance efforts. (C) Copyright 2016 Peraso Technologies, Inc. All rights reserved.